Panda Condos is a new per-construction condos project located at 20 Edward Street, In Toronto,Yonge Street/Dundas Street. Develop By Lifetime Developments. The Project will have 122.3 Meters high, 29 storeys with total 579 Units. there have total 8996 square metres (96,835 square feet) of retail space on the belowgrade concourse level and the ground and second floors and office uses on the third floor. the site was the World’s Biggest Bookstore Site. Panda Condos will step to Subway, PATH system and street car stop,very close to the Eaton Centre, business tower and retail shops, walking distance to Ryerson University. just few Subway stop to university of Toronto. Panda Condos is a new condo development by Lifetime Developments coming to 20 Edward Street near Yonge and Dundas Square. Panda Condos is a mixed-use building with restaurants and retail on the below grade concourse level, the ground level, and the second floors—and office uses on the third floor with condominiums above. Designed by architectsAlliance, Panda Condos will be a 30 storey tower with 629 units, 317 are 1-Bedroom, 219 are 2-Bedroom and 93 of which will be 3-Bedroom suites. Panda Condos was previously occupied by the “World’s Biggest Book Store” retail store. You will have easy TTC access to Dundas Station transit and Toronto’s underground PATH by connecting through the Atrium on Bay building located immediately to the south across Edward Street. There is also potential for a direct connection to the P.A.T.H. from the south-eastern corner of the concourse. If built, the residents of Panda Condos would be able to access the TTC without going outdoors. The building entrance will be accessible from the southeast corner at Edward Street. While walking on Edward street the main floor of the building will contain mostly retail shops. The amenity space is offered both indoor and outdoor. There is 9,600 square feet of indoor amenity space and 7,600 square feet of outdoor amenities. The building features a green roof with over 7,500 sq. ft. allocated on the 28th floor and covering the mechanical roofs. Panda Condos will have 4 levels of underground parking with space for 241 vehicles and 627 bicycles. Panda Condos has a perfect Walk Score of 100 out of 100. The transit score are perfect 100 out of 100. This location is in the Bay Street Corridor neighborhood in Toronto. Nearby parks include Larry Sefton Park, Trinity Park and Labyrinth and College Park. 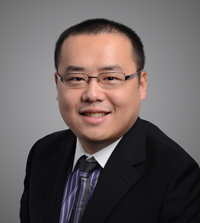 Mark Li (Sales Representative) isÂ independent Realtor with CENTURY 21 Leading Edge Realty Inc., Brokerage in Toronto. Â He specialize in pre-construction homesÂ and through hisÂ developer relationships have access toÂ INSIDER SALES & TRUE UNIT ALLOCATIONÂ in advance of the general Realtor and the general public.